In addition to loving to work in my woodshop, I also have begun to paint (being married to Gail, I say that I paint out of self-defense). So, I am now gaining hands-on experience in using my own easels. We travel a lot, so we specifically concentrated on creating easels that are rugged and sturdy but also lightweight and sleek in design, and that fit easily into bags without any bulky exterior hardware. 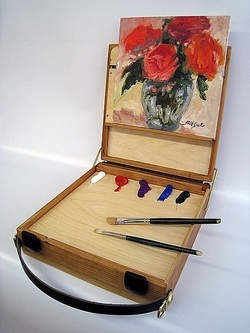 Our intention was to create the most elegant and useful easel on the market. I think we have succeeded and we hope you will agree.